Our walking tour through the historic centre of Rome took in history from ancient times through the 17th century Baroque and up to the 20th century. Many of the stops we’d heard of or seen in films and I was surprised to find how close together everything is – the whole walk was only about 2.5km (1.5 miles). 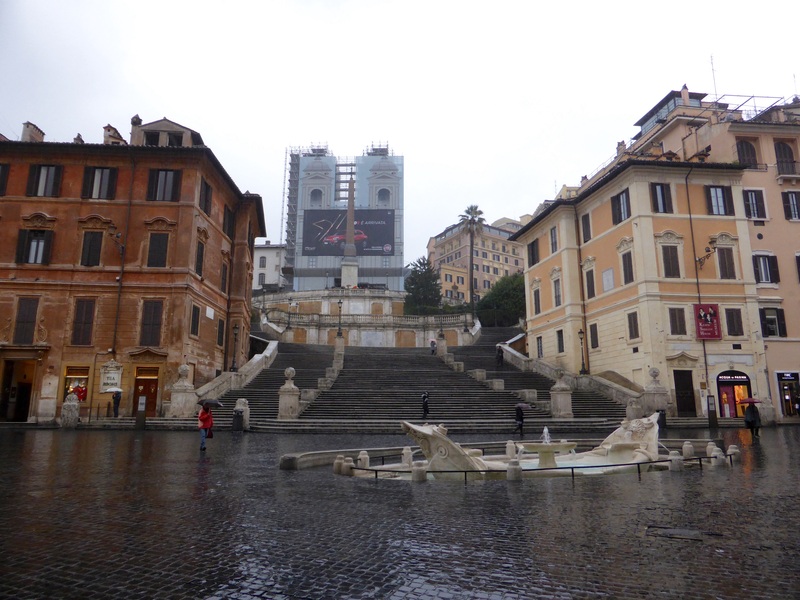 Our first stop was at the Spanish Steps. In Italian they’re called Scalinata della Trinità dei Monti which refers to the church at the top, the English name comes from the Spanish Embassy which is at the bottom. The shops around here make up one of the most exclusive shopping areas of Rome and we spotted lots of designer label shops nearby. 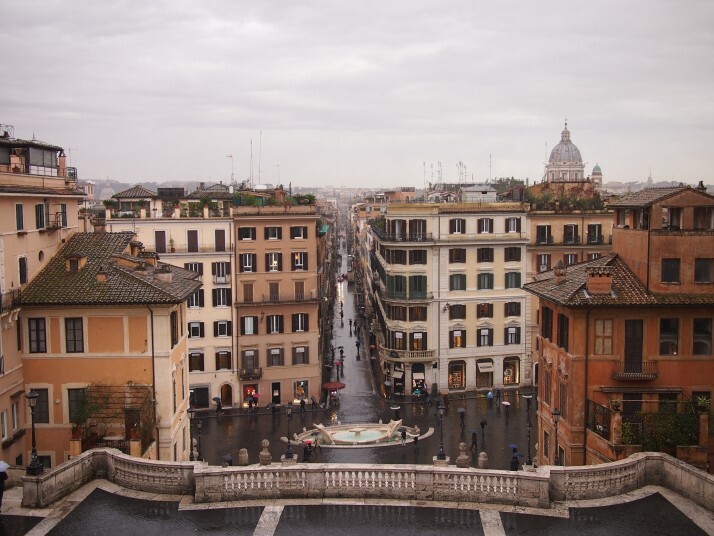 There are 135 steps linking the Piazza di Spagna (Spanish Plaza) with the Church of Trinità dei Monti, apparently in the summer they are crowded with people but not many were in evidence at 9am on a rainy morning in February. At the foot of the Spanish Steps is the house where John Keats lived and died, and just a few doors further along is the former home of Giorgio de Chirico. 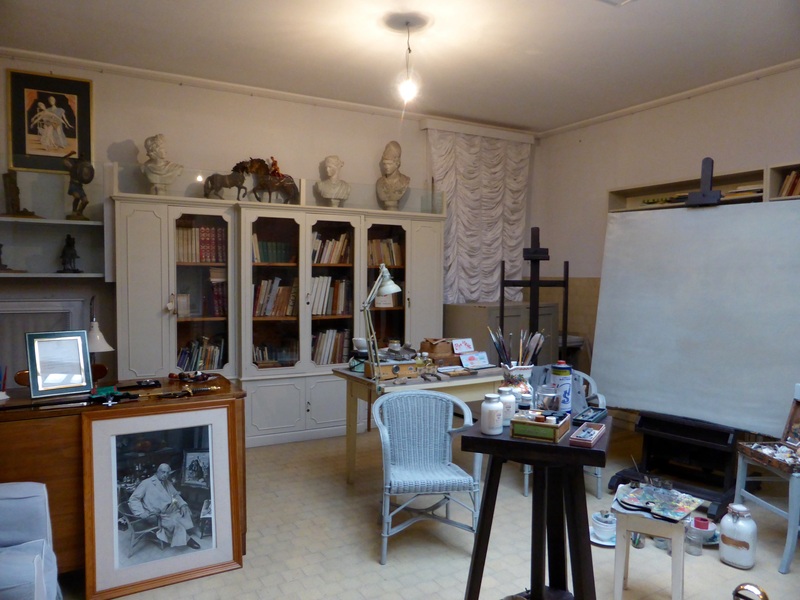 We’d never heard of the 20th century Italian artist but his paintings looked interesting so we booked ourselves in for a tour of the House-Museum. De Chirico described his art as Metaphysical. 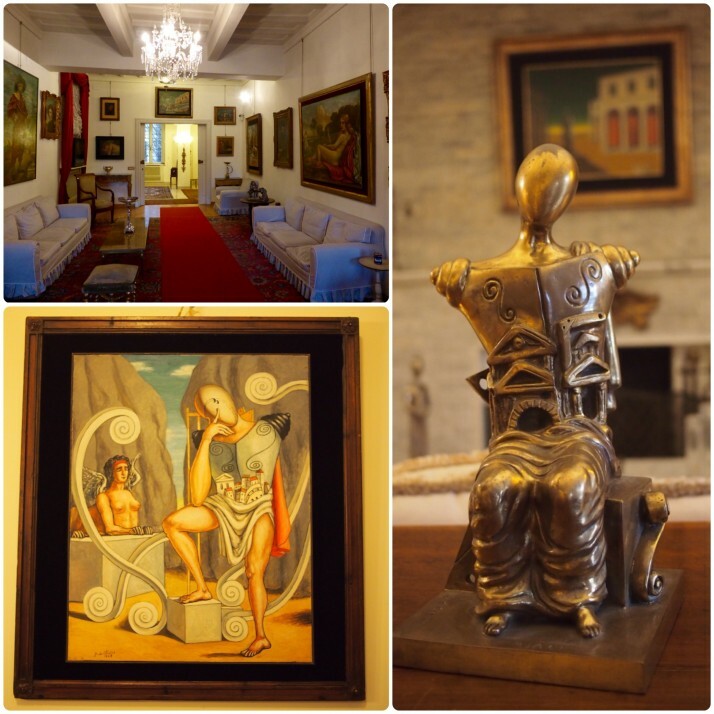 His work reminded us of Salvador Dali – classical subjects, lots of paintings of his wife, other-worldly protagonists – and, in fact, Dali cited De Chirico as an influence. Judging from the description of him by our guide it sounds as if his ego and eccentricities were similar to the Spaniard too. 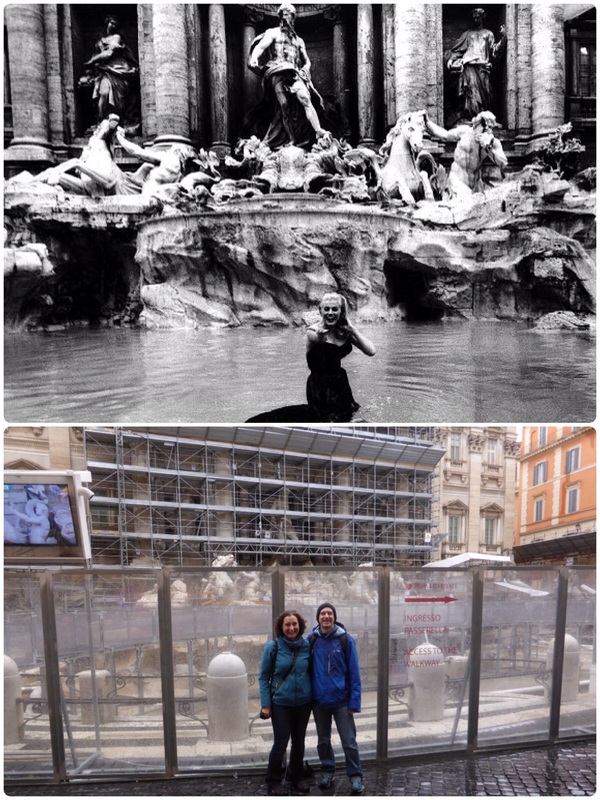 Anita Ekberg in ‘La Dolce Vita’ [source: The Times]; and us, similarly soaked but considerably less glamorous! 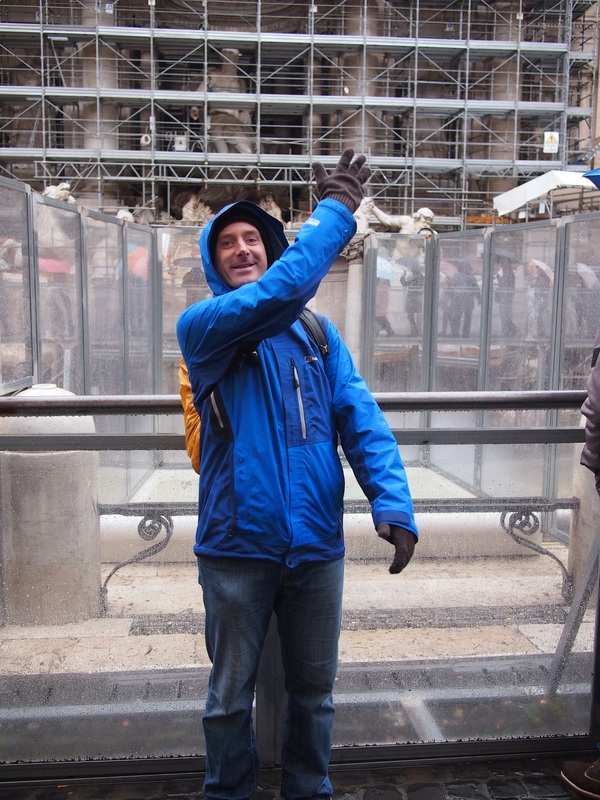 Legend has it that if you throw a coin into the Trevi Fountain you are certain to return to Rome. A small pool has been set up in front of the drained fountain basin to allow tourists to continue the practice. It’s so popular that tens of thousands of euros are collected every year and subsidise a supermarket for Rome’s needy. Just around the corner from the Trevi Fountain, but with far fewer tourists, we sheltered under the glass roof of Galleria Sciarra to eat our sandwiches. It was built in the late 1880s and was intended as a shopping centre although later it became the headquarters of a magazine and nowadays, amongst other things, houses an Anti-Corruption Agency. 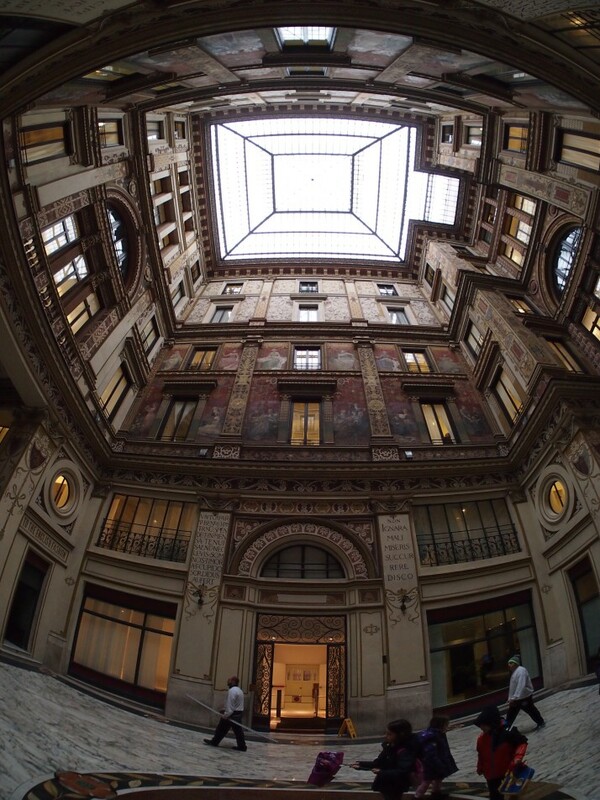 The walls of the courtyard were painted by Giuseppe Cellini in the Art Nouveau style. 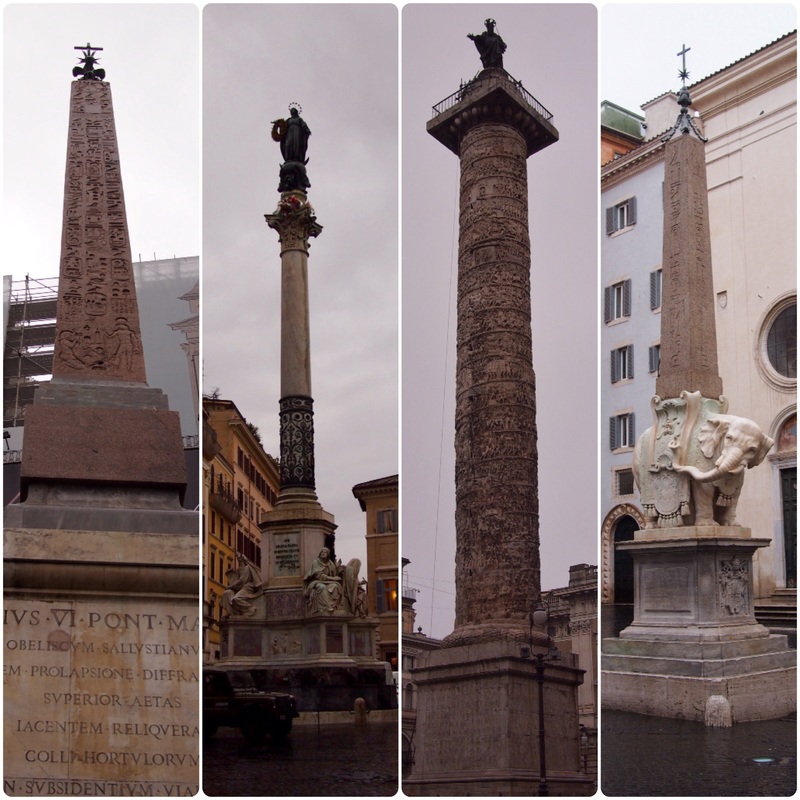 Moving on from there we continued through narrow cobbled streets and piazzas noticing that Romans seem to be obsessed with putting tall pointy things in the centre of their squares, it seems that practically every open space has an obelisk or column of some description. On our way to the next stop we passed the remains of the Temple of Hadrian, only one wall and 11 columns of the 15 which would have lined that side survive. Each column is 15m high and it is still an impressive sight. The building that it is now part of was holding a Poetry Slam competition on the day that we passed. Other than the De Chirico Museum, the main ‘sight’ on the tour was the Pantheon which is one of the best preserved of all the Ancient Roman buildings. 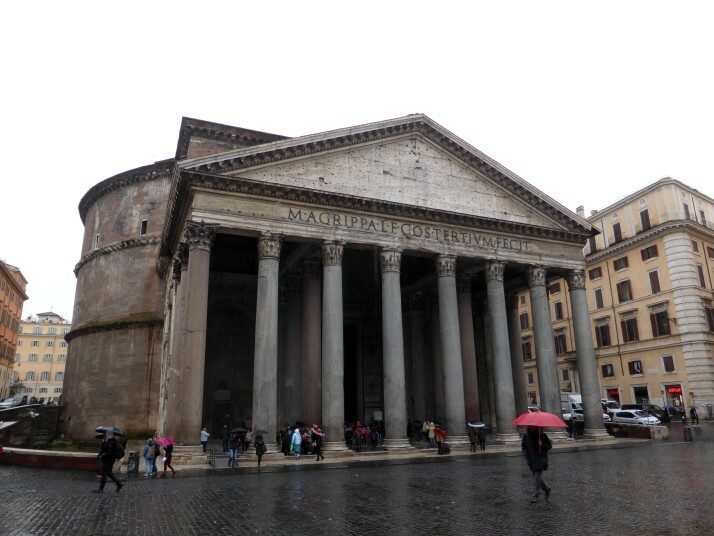 It was originally built in round 26BC by Marcus Agrippa but had to be reconstructed twice (following the original design) due to fire. The current structure dates from 126AD. 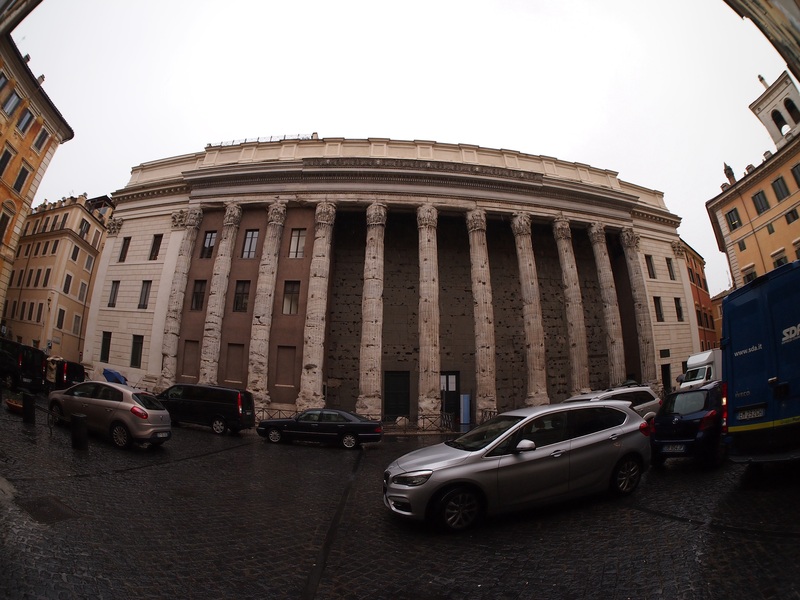 The structure is essentially a cylinder topped by a dome and fronted by a rectangular portico. 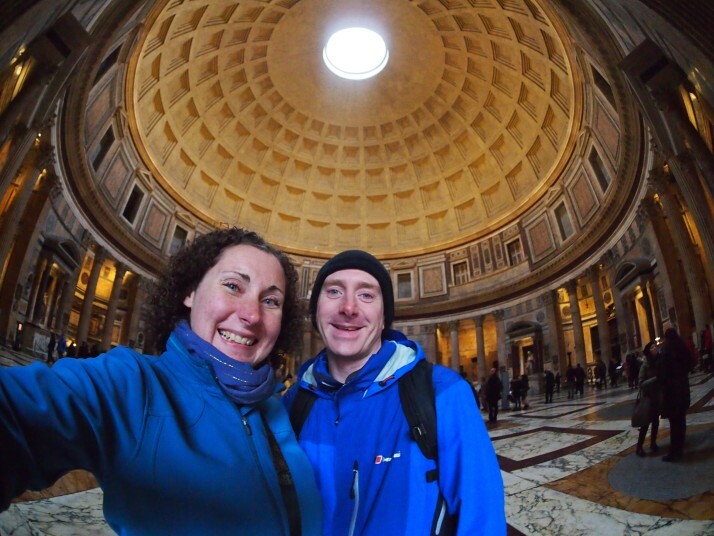 Nearly 2000 years after it was built it is still the world’s largest unreinforced concrete dome – we didn’t even know that concrete existed in Roman times! 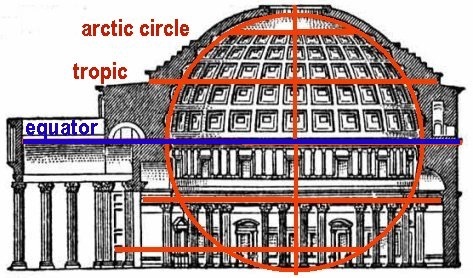 It has a diameter of 43.4m and rather pleasingly, for me at least, the height of the dome is also 43.4m which means that a sphere would fit neatly inside as demonstrated by this diagram which I found during my research. At the top of the dome is a round opening called the oculus which is part of the reason that it could be built so wide. It was pretty cool to see the rain coming down through the hole and it was the only time during the day when we were even slightly glad that it was raining. The floor is designed to drain in the centre but even so a large section was cordoned off to prevent slippages. 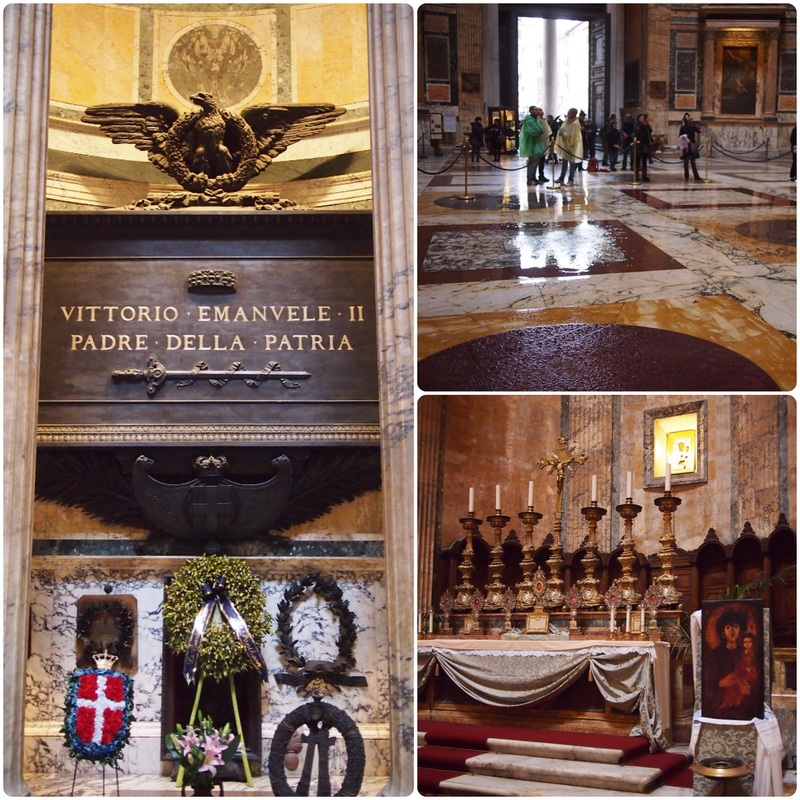 The Pantheon was converted into a church in the 7th century which accounts for its good state of preservation. The sides of the cylindrical walls contain a number of small chapels and some tombs including two of Italy’s kings and the artist Raphael. Our final stop was just two blocks away through the winding streets, Piazza Navona. A long, narrow plaza, it was formerly the site of a stadium. 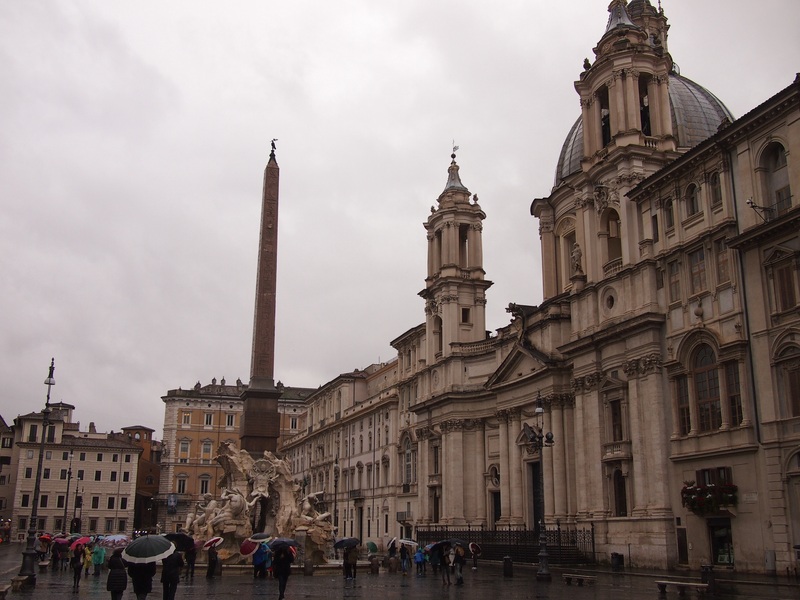 Along one side is a very grand church, Sant’Agnese in Agone, and it contains three fountains, obviously the central one has an obelisk! Unfortunately, the rain which plagued our stay in Naples seems to have followed us to Rome, initially at least. We comforted ourselves by taking hot chocolate breaks to warm us through and get some feeling back in our hands. This entry was posted in Places and tagged Art, Church, Italy, Museum, Rome on February 15, 2015 by Julie. You’re not being terribly lucky with the weather, you poor things! I don’t wish to tempt fate but that was the last bad day we’ve had here and the last week has been lovely, very spring-like – I even sat out on our balcony for an hour the other afternoon! Fingers crossed then. It’s lovely here too today.